Pombaline Lisbon is part of the Tentative list of Portugal in order to qualify for inclusion in the World Heritage List. Two reviews of Lisbon! Pombaline refers to a Portuguese architectural style developed in the 18th century following a devastating earthquake. That said, what is experienced by any visitor to central Lisbon is a well-laid out grid dominated by Praça do Comércio. The streets are lined with elegant structures (typically 4 storied buildings), pattern tiles and a pleasant color palette are in abundance. What I appreciate about the design and layout of Pombaline Lisbon is its functionality for a more modern cityscape and how the royal character of Lisbon (post-earthquake) was transplanted to a commercial zone linked to the Tagus River. This is felt by any person walking the street today, regardless of their architectural interest. The commercial character of the district is undeniable, the grid layout is easy to navigate, and even the most directionally challenged traveller should with relative ease be able to find commerce square. From the four tentativ sites within the city of Lisbon this seems to me the one with the best perspectives. It is a nice area to walk around though you have to suffer somebody begging or offering their business every five meters. There are nice long views and big squares of which the Rossio is probably the most enjoyable. This site wakes already a lot of interest though its connection with the terrible 1755 earthquake. The application text is incredibly long which raises the suspicion that they are not so sure about which were the main arguments for the nomination. Some of the claims are quite grand: "the first modern Western city, unique within Europe and indeed the world", „It was the very first to be conceived and executed according to the criteria and comprehensive methodology that continue to form the basis for the urban planning of all newly constructed or regenerated cities today.“ They claim also a „utterly innovative orthogonal plan“. But how original can a orthogonal plan be, when orthoganal cities can be found long before in ancient Greece and Babylonia and in Spanish colonies a hundred years earlier? The most interesting of the many mentioned criteria may be the earthquake-proof and fire-proof structures, drainage systems for wastewater and rainwater and the planning and creation of a rubbish collection system. Again, the singularity of all this had to be proven. When I searched on the internet I couldn’t really find a lot of information about any of those features. Maybe it is only available in Portuguese. Walking around the city I found it interesting that the also very nice Barrio alto neighbourhood northwest of the Baixa had a rather similar layout but was designed and constructed in the 16th century. Perhaps there is a connection worth exploring even for this nomination? 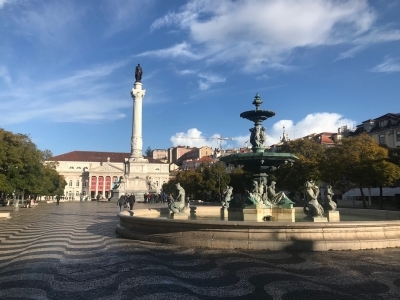 On a previous visit to Lisbon we had of course seen the central Baixa district and noted its coherent design created after the 1755 earthquake, but it hadn’t really occurred to us that it might justify WHS status. So we paid more attention during our recent trip in Apr 2012! Mind you, the entry on the UNESCO web site introducing the T List site doesn’t sound very hopeful! “Despite the absence of any institutional framework, or even systematically and coherently published and publicised opinion, the idea of putting forward the Pombaline "Baixan”, or old downtown district of Lisbon, for World Heritage listing has been evaluated summarily by several political and cultural institutions, and the possibility of preparing and organising such an application has been discussed, albeit without a formal presentation or accompanying documentation” …. “Although the logic behind the physical limits of the Pombaline "Baixa" is rather unclear-and somewhat fluid” ……. “in the last century, careless and erratic management may have jeopardised important features of authenticity and singularity, perhaps irreversibly”. b. 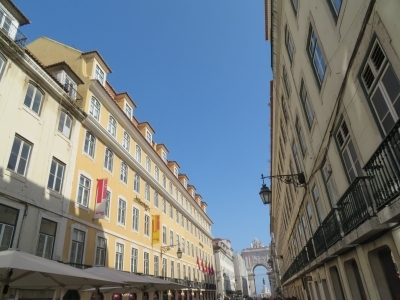 The Chiado – the transition area between “Baixa” and “Alta” and a major shopping area. Its reconstruction was also a part of the Pombaline plan. A major fire in 1988 area destroyed a large area of it and it is only just completing restoration. Using the 2004 description, I would have expected the former to have been included and the latter largely excluded. However, reading available documentation, it is clear that there has been some major rethinking going on about the boundaries. Although Lisbon’s original hope was for inscription to have been submitted by Jan 2006 the Portuguese government decided that more work needed to be done on matters such as a Management Plan and the nomination was put on the back burner – particularly, it is said, whilst Portugal progressed the inscription of Fado on the Intangible List! More recently it has been resurrected and dusted off as part of Lisbon’s Carta Estratega through to 2025 and plan for the revitalization of Baixa-Chiado. In particular it seems to have been decided to extend the site to the full boundaries of the Pombaline plan. See this link. That’s a big task – a large part of the centre of a major city to be managed to UNESCO’s high standards? Can Portugal really achieve it in the foreseeable future – especially given its current financial problems? And is it worth it? Well I have certainly come to value more highly what I saw from having studied its history and am fully prepared to accept its OUV credentials. But Portugal seems excessively bullish regarding the criteria it intends going for -“… sobre sucessivas sugestões ou propostas dos vários membros, que conduziu a preencher se todos os seis critérios regulamentares, embora tal não fosse necessário” (All 6 criteria “even though this isn’t necessary”!!!). It apparently intends making a virtue out of the Non-Pombaline developments in the area as demonstrating the living/developing nature of the city! After the big shake of 1755, the new buildings incorporated a set of features intended to supply them with adequate seismic behavior, enabling them to resist horizontal loads and to dissipate a considerable amount of energy. Among these measures the so -called �Gaiola� (the Cage) stands out , unquestionably Gaiola is based on a set of timber members embedded along the inner face of the main stone masonry facade walls. �Baixa Pombalina �allow us to interpret an outstanding anti-seismic construction system, which was a step beyond its time. Today it still reveals high efficiency.